I’m participating in the Ratio Challenges this year, hosted by Seattlejo of Fat and Crafty. Every two months, we experiment with a different ratio from Michael Ruhlman’s book: Ratio: The Simple Codes Behind the Craft of Everyday Cooking . For every 5 oz of flour add 1 tsp baking powder, pinch of salt and 1 tbsp of sugar. Think of the flours you can use, different liquids, savory versus sweet, how big of a batch , how small of a batch can you make? Go forth and make pancakes! In the interview at Chow, Ruhlman notes that a large egg is approximately 2 ounces. My husband and I usually figure one egg per person (also recommended by Ruhlman in the same interview) if the batch is to be the main portion of the meal. I sat, staring at my screen. This was a completely new way of thinking about recipes for me. What could I do with what I have in the pantry? What flours and fats should I use? How will the different protein counts of the various flours affect the final product? Let’s find out. All of the ratios I came up with were figured off of the original pancake ratio; no fritters yet. All of them mix the wet and dry ingredients together separately before combining both, then frying over moderate heat until golden brown and delicious. I came up with four ratios to try off the bat. I never attempted to make more than enough for two because, well, we don’t have a dog or kids to justify a larger batch. 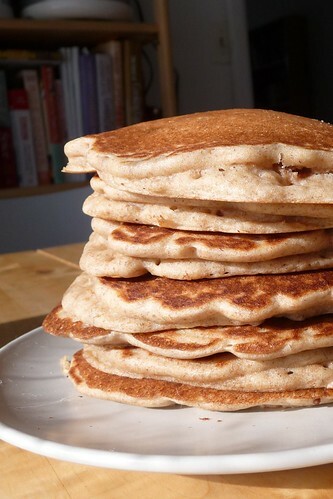 I did, however, find that a batch made from two eggs made about a dozen pancakes — enough for four! I cut the ratios down to 1-egg ratios after the first experiment because two eggs’ worth is just too much. I also found that up to 1/2 cup of water could be necessary to thin it to a pancake batter consistency, depending on the ingredients I chose. Perhaps I was going with liquids that were too dense. Combine wet ingredients in a small bowl, combine dry ingredients in a medium bowl. Add wet to dry and stir well. Add water to thin if desired. Heat a lightly oiled pan over moderate heat and fry until golden. These came out beautifully with a light beer flavor. We topped them with drizzled honey and had them for lunch. This ratio made a dozen 4″ pancakes — more than enough for two, plenty for three or four. This batter came out too thick for my taste and needed 1/2 cup of water. This entry was posted in american, Ratio, recipes, untranslated. Bookmark the permalink.